For the similarly named adjoining municipality, see Cuautitlán. By 2005 Mexican national intermediary (conteo) census figures, the city of Cuautitlán Izcalli is the sixth-most populous in the state, with its population of 477,872 dominating a municipality of 498,021 people. The second-largest community in the municipal area of 109.9 square kilometres (42.4 sq mi) is the town of Huilango. 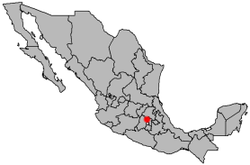 It is bordered by the municipalities of Cuautitlán, Tultitlán, Tlalnepantla de Baz, Atizapán de Zaragoza, Nicolás Romero, Tepotzotlán and Teoloyucán. Cuautitlán Izcalli municipality was created in the 1970s, carved mostly out of Cuautitlán de Romero Rubio (now simply 'Cuautitlán'). Originally planned as the first self-sufficient city in the neighbourhood of Mexico City, the city's design was based on European and American cities and included an industrial, a residential and several green areas. After the 1985 Mexico City earthquake, however, the plans fell apart due to a large influx of people searching for zones, such as Cuautitlán Izcalli, with no seismic danger. Nowadays almost 75% of the municipality's residents work in nearby cities such as Satellite City and Mexico City, causing enormous congestion on the only highway available, the Periférico. Several shopping malls have opened in recent years, including San Miguel, San Marcos, and Luna Parc, which compete with Perinorte to the south of the municipality. There is a Ford Motor Company plant, assembling Fiestas (F-Series before 2010), and a Bacardi spirits factory. Cuautitlán Izcalli is home of the Centro Episcopal Mexicano visited by Pope John Paul II during his 1991 visit to the country. You can find the largest San Benedict's Abbey in Mexico and the second largest music auditorium, Teatro San Benito Abad, in the urban area of Mexico City. Juan Manuel Gliffard, who was from Cuautitlán, took part in the discussions leading to the Constitution of 1917, under the rule of Venustiano Carranza. He was exiled in 1923. 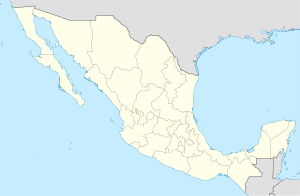 On 9 June 2014, Pope Francis erected the new Izcalli Diocese to serve the area, with territory taken from the Cuautitlán Diocese; the two dioceses are both among the suffragan sees in the Ecclesiastical Province of the Roman Catholic Archdiocese of Tlalnepantla in Tlalnepantla. ^ "Enciclopedia de los Municipios y Delegaciones de México". Instituto Nacional para el Federalismo y el Desarrollo Municipal. Retrieved August 26, 2015. ^ "Enciclopedia de los municipios de Mexico Estado de Mexico Cuautitlán Izcalli". Archived from the original on 2007-09-30. Retrieved 2008-03-07. ^ "Link to tables of population data from Census of 2005". INEGI: Instituto Nacional de Estadística, Geografía e Informática. Archived from the original on 2013-02-27. Wikimedia Commons has media related to Cuautitlán Izcalli Municipality.